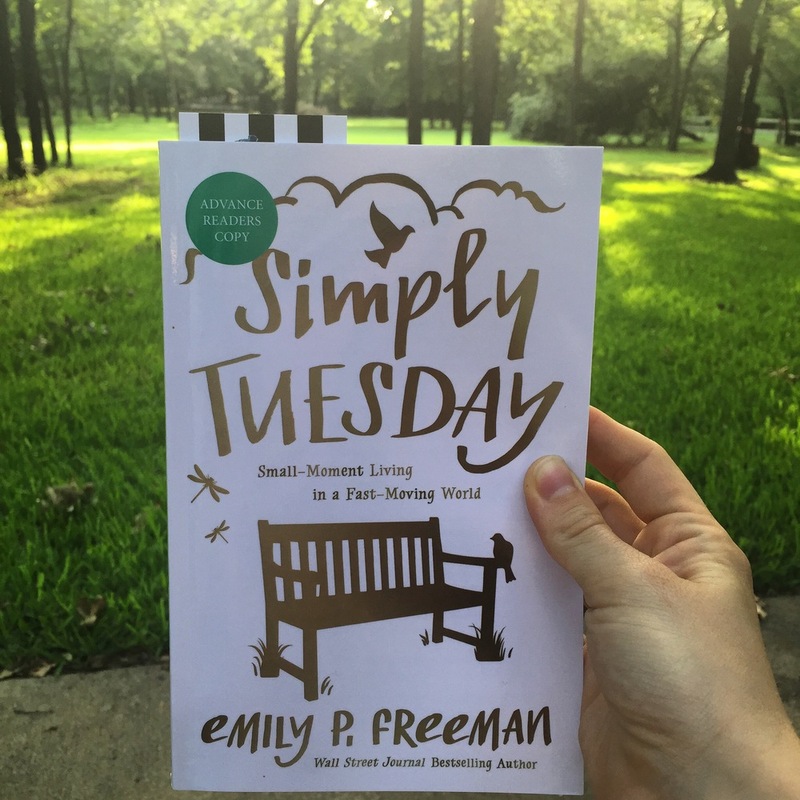 By now, many of you have heard about the book that's been on my mind lately: Emily P. Freeman's Simply Tuesday: Small-Moment Living in a Fast-Moving World. I've been honored and blessed to be on the launch team for this book, which is released this coming Tuesday (finally)! There has been so much that I have learned in the process of reading and re-reading this book (it's that good, y'all). I have learned so many wonderful, marvelous, utterly relaxing things about God that have changed my relationship with Him. I have learned things about myself, both things I didn't want to know and new, delightful discoveries. One of the not-so-good things I've unearthed is my own competitiveness. I have felt it rising for a while. I am constantly comparing myself to other people. Constantly. How do I sound in comparison to her? Am I at the right level compared to him? Am I thinner than her? Do I work harder than them? I shudder to write these things, because they are the ugly parts of my heart. This is a dark place. These comparisons set my mind spinning, whirling, gyrating madly, unable to stop. When I compare myself, I instantly feel my soul launch into the modes of work and of self-defense. Walls instantly go up. I find myself unable to relax, unable to enjoy the moment. I am held captive to needing to achieve, to comparing myself. I have found that I resent the accomplishments of others, because I fear that their accomplishments take something away from me. Yes, it's a dark place -- but it's slowly growing lighter. Emily talks about her "tendency to look over at the work of others rather than down at the work in front of me." I so identify with this. Then she recounts a story of watching some lifeguards at the water park. Each lifeguard was assigned to eight feet of the pool. They were totally absorbed with that eight feet. They were 145% focused on their own work. They were not concerned with the eight feet that others were working on, because they were not responsible for the entire pool. "They weren't hyperventilating over the parts that weren't their responsibility." My job is not to be the best. My job is not to compare my work to the work of others to see how I measure up. My job is to focus on my eight-foot assignment. I am not responsible for all the other things. I am responsible for the job God has given me to do -- not my friends, not my colleagues, not the people i dislike. I'm responsible for what God has called me to do, what He has placed in my lap. Jesus "doesn't equip me to do every job possible, He equips me to do the job meant for me." The best way to sabotage my own success it to be obsessed with someone else's. There's another side to this coin. Even when I try to focus on my own work, it is impossible if I am eaten away by the need to prove myself good enough -- and in my mind, good enough often equates to better than. This sickly drive of competition prevents me from meeting people where they are. It keeps me from entering into community with them. If I'm competing with you , I can't connect with you. Recently I've felt a dryness in my own life that comes from a lack of community. Part of that comes from summer, but when I read these words, I realized that my competitiveness prevents me from simply being with people. Instead of being still in the presence of God and others, I strive in my heart and head, unable to relax. This keeps me from knowing people, truly knowing them, and being a haven for them. It was keeping me from being one of their Tuesday people, a safe place to feel insecure. I have been the opposite of safe place. Don't tell Sara -- she'll hide it away in her mind. I don't think that's actually happened, but I shudder at the thought. Emily reminds me that people need me to be with them. "They don't need for us to impress them... They need to know they aren't alone." People need us to embrace a relational smallness, accepting we are not the star, the counselor, the convincer, or the fixer. Instead, we are a companion, willing to keep company with the soul of another. We need not compete, we need only to connect. The struggle is pretty real here, y'all. I am not fully healed. I still find myself comparing my work and striving to compete. When I am assailed by the demons of strife, I am reminded that the accomplishments of others do nothing to infringe upon my own. And when I am comparing and competing, I am also forgetting who I am: I am a child of God, and He has declared that I am safe. I no longer have the need to prove myself, because I am already accepted. And He has given me a job to do -- not my mom's job, not my friends' jobs, not my fight club partner's job, but my own. And when my focus is on Jesus and on the work He has given me to do, and when I remember Whose I am -- well, then, the rest is nothing. It vanishes into the wind like dust. When I remember that I am safe and worthy in Jesus, then I am truly free: free to rest, free to relax, free to do my work with joy and without comparison. I am free to be who I most fully am in Jesus. I am free to sing, to write, to go through life, to relate with no fear at all. I am free to adventure -- who can touch me if I am free in Jesus? What can disturb me? I'm still learning these things. I have to re-learn them every day. But my soul is being rescued from the way it harries itself. Rescue isn't pretty: it involves going into dark places. But Jesus enters those places in order to bring light to them. He adventures, too. Isn't it beautiful? I'm so excited about Simply Tuesday -- maybe you are, too! If you're searching for peace and quiet and hope in your soul, or if you just think this sounds like a really good read (it is), then do Emily a favor and order it! Hop on over to Amazon or Barnes & Noble -- it's under $10 in both places! It officially releases this Tuesday, August 18.